In 2009, Allure Films had the honor of capturing Lauren Briglia and Pete Pryzbylkowski’s wedding day on video. In the summer of 2017, we were beyond thrilled to have reconnected with this amazing family and document Lauren’s sister, Alison, on her special day marrying the love of her life, Jeremy. Everything about Alison and Jeremy’s wedding represented timeless style and pure romance. The official wedding ceremony was held at the Cathedral Basilica of Saints Peter & Paul, where the aisles of the Roman Catholic church were filled with friends and loved ones seated amongst beautiful ivory floral décor created by Evantine Design. The reception took place at The Logan in their Grand Ballroom. The amazing floral decorations illuminated by countless candles created a spectacular backdrop for this wonderful celebration. Susan Stripling was there to photograph not only the amazing décor, but also to get group shots of the bridal party at the Rodin Museum in the courtyard around the whispering waterfall and fountain. The bridal party and guests were able to dance the night away in style to the music of the BVTLive!’s Jellyroll band. Jellyroll kept everyone on their feet by performing a wide range of music styles from today’s top pop hits to Motown. There was definitely a lot of love and fun in the air on Jeremy and Alison’s day. Not only will the happy couple have great memories to look back on, but they’ll have the whole day on film where they will be able to watch themselves recite their vows to each other, and re-watch the touching speeches made by loved ones in celebration of their union. Congratulations, Alison and Jeremy, and thanks for letting us continue to be a part of your family’s special days! We look forward to capturing touching moments with you for years to come. Another fairy tale wedding in the books – and we’re still reeling from it! Tracy and Brandon exchanged their vows at the Cathedral Basilica of Sts. Peter and Paul in the heart of Center City Philadelphia. While preparing for the big moment, they were able to relax and enjoy a morning of pampering with their bridesmaids and groomsmen at the Hotel Monaco. Tracy’s bridesmaids looked gorgeous in their matching silk robes! After the ceremony, the newlyweds were joined by their bridal party for an adorable photo shoot. So many smiles, hugs, and kisses were exchanged between the bride and groom, as Sara DiCiccio Photography snapped shot after shot with the Allure Films team filming the entire time. The group made their way to The Curtis Center, one of our favorite reception venues in the city. With its famous Tiffany mosaic and sky-high ceilings, it truly is a breathtaking place to celebrate a brand new marriage. We love the look on Tracy’s face when she first stepped into the reception hall and saw the stunning décor! The dance floor was packed all night long as the bride and groom partied with their guests to the sound of the stellar band Strangers from BVT Live! As the evening came to a close, the bride and groom were led off into the night by a sparkler send-off. What a romantic end to a beautiful day! 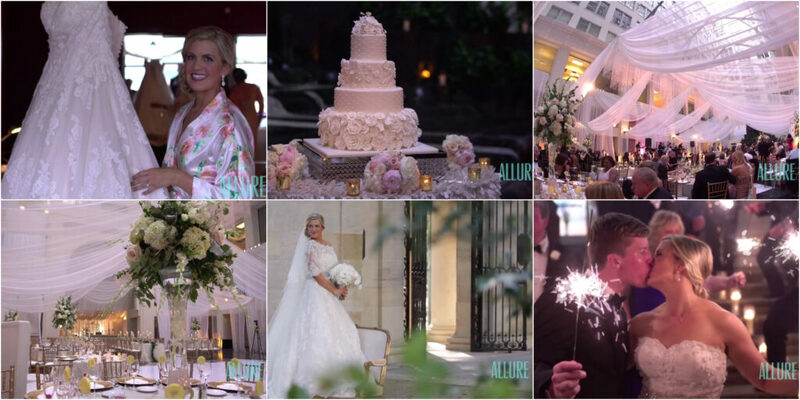 Allure Films was thrilled to document Tracy and Brandon’s big day. Thank you for letting us be a part of it! What an overwhelming day filled with love! From the love for their country, to the love for their city, to their undying love for each other, Christine and Evan’s wedding day was one of the most romantic events that Allure Films has had the privilege of filming. As members of the United States Air Force, the beautiful couple carried a patriotic theme throughout their wedding. Red, white, and blue dresses, flowers, and even the wedding cake kept everyone feeling festive and the venues looking incredible. Christine and Evan exchanged their vows at the stunning Cathedral Basilica of Saints Peter & Paul, right at the heart of Philadelphia. 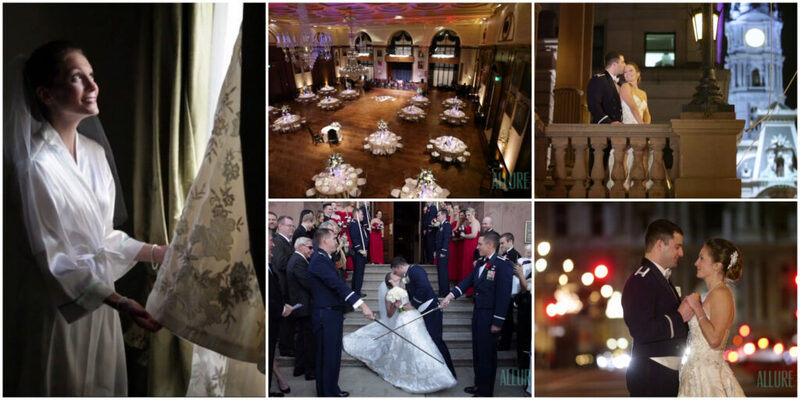 Afterward, they were whisked away to some of Center City’s most amazing locations, where our friends at Philip Gabriel Photography snapped photographs of the entire wedding party having fun. After sneaking several kisses underneath the new “AMOR” sign at the top of the Art Museum Steps, the newlyweds moved the party to The Union League of Philadelphia. With more than 150 years of history supporting the United States military, it was the perfect place for Captain and Mrs. Farren to celebrate their marriage. From the lively music by EBE Dreamtime to Evan’s one-of-a-kind Eagles party shirt hidden under his uniform jacket, the fun-filled reception was definitely one for the books. Philip Gabriel Photography | EBE Dreamtime | The Union League of Philadelphia | Carl Alan Floral Design Ltd. This is one fun-filled Philadelphia wedding video that you simply have to see! 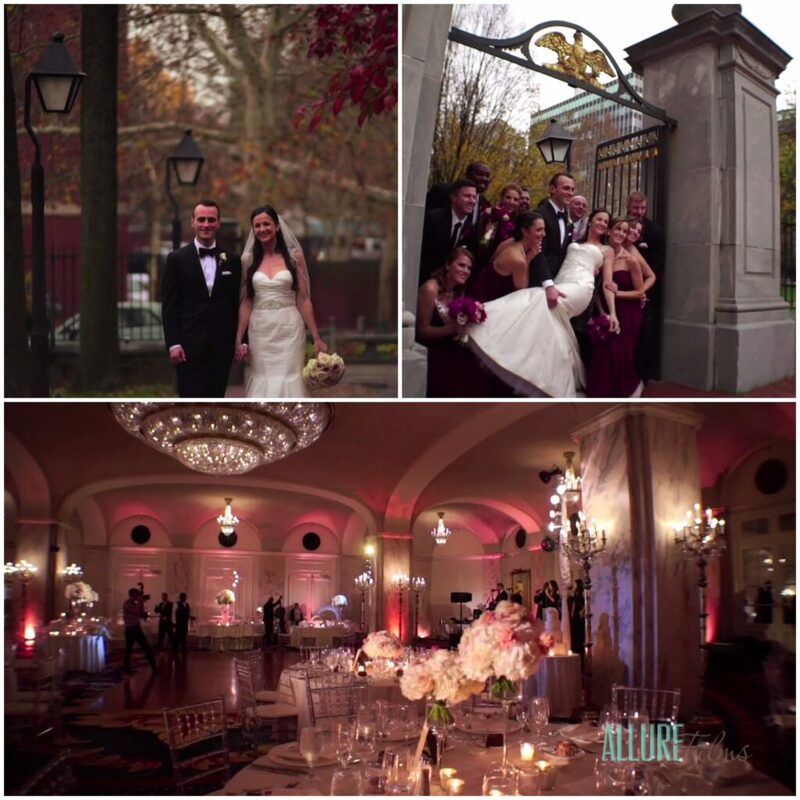 The Allure Films team was thrilled Jennifer and Gregory asked us to document their gorgeous Philly wedding. They would be celebrating their special day in not one, but two of our most favorite locations! 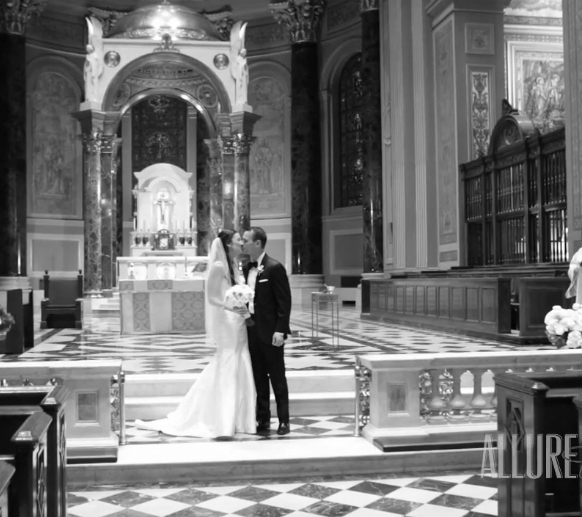 Their ceremony took place at the jaw-dropping Cathedral Basilica of Saints Peter and Paul. The cathedral looks like something straight out of the Vatican with its breathtaking columns, antique marble, and beautiful stained glass,. It felt even more special illuminated by the smiles of the happy couple. After the ceremony, the party really got started! We all climbed into a party bus and made our way over to The Ritz-Carlton. Along the way, we made a few stops at some of Philadelphia’s most beautiful landmarks. The gorgeous fall foliage created the perfect backdrop for the entire wedding party to strike funky poses, and the Allure team was there to capture every happy moment. As we filed into The Ritz, everyone’s jaws drop. The always-elegant venue did not disappoint. The décor was perfect, and EBE’s Rio kept the party going all night long with their flawless musical performances. Congratulations to the newlyweds, and thanks for inviting Allure Films along to capture your big day! Click here to speak with an Allure Films representative about our wedding videography packages. Join Julie and Joe as they celebrate their big day. Become a part of the touching moments of preparation leading up to the ceremony and reception. The exciting moment before the first reveal was one of our favorite parts of Julie and Joe’s wedding. Our love birds tied the knot at St. Peter & Paul Basilica, and followed with a reception at Hyatt at the Bellevue. Eventricity’s talented team provided quite an astonishing scene of decor. We’re sure you’ll love the wise words of advice shared during Julie and Joe’s reception. “A successful marriage is built on falling in love many times & always with the same person.” We couldn’t have said it any better ourselves! Enjoy this glimpse into Julie and Joe’s fun-filled wedding day. Congrats, from all of us here at Allure!